My niece graduated from high school a few weeks ago. It can’t be; it seems like yesterday I was teaching her to play look-y with her food, giving her Mt. Dew before bedtime, and taking her to see animated movies. But nevertheless, she heads off to college in August. She’s a super-smart girl - graduating Valedictorian of her class while playing basketball and participating in track, being involved in community projects, and working part-time jobs. Because she was so busy, my sister tended to do a lot of stuff for her – like laundry. Back in April, I told Monica that she needed to let Kaysie start doing her own laundry, otherwise she’d be in for a rude awakening once she was on her own. Either that or she’ll bring her laundry home for her mom to do every weekend. I suspect Kaysie’s not the only one that needs laundry practice. Here’s a guide to give your college bound kids so that they don’t bring their dirty clothes home to you every weekend. 1. Check all care labels. Separate out items that need to be hand washed or dry cleaned. This would also be a good time to check pockets. 2. Keep bath towels and bed linens separate. They can withstand the highest temperatures and most aggressive cycles. 3. Separate remaining items into darks, lights, and whites. 4. Separate lint generating items (like sweatshirts) from lint draws (like corduroys). 5. Turn treasured items and blue jeans inside out. This will reduce the chance of color loss. 6. Be sure to zip all zippers. 7. Place any delicate items to be washed separately into mesh bags. 8. When sorting, be sure to pre-treat any spots or stains. 9. Loosely place items in the washing machine. 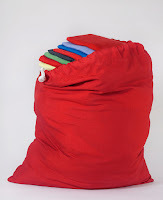 Never overload the machine – clothes won’t come clean if there isn’t enough room to agitate. 10. Select cycle, water temperature, and detergent according to the care label’s directions when washing garments. 11. Once garments have been washed, check to see if spots have been removed before placing clothes in the dryer. If the spot is still there, do not put the item in the dryer. The heat will set the stain. Instead, place it to the side to treat and wash again. 12. Clean the lint trap before putting clothes in the dryer. 13. Select dryer time and temperature according to the care label’s directions. 14. Since garments dry at different rates, keep like drying requirements together. 15. Be sure that they dryer isn’t overloaded. If the dryer is overloaded, it will cause some items to over dry and others to remain damp. 16. Remove clothes from the dryer as soon as they are finished and either fold properly or hang on appropriate hangers so that wrinkles don’t start forming. Of course you can always do what I did when the laundry basket was full and the closet wasn’t – go shopping. Though I suspect that my sister will cut this part off before giving the list to Kaysie. Can Carpeting Impact Your Health?